Although summer is traditionally a slow time for many organizations it is even busier than usual this year at the Institute. Dr. O’Neill is working on the final edits of the newest edition of The High Frontier. Just this week we received the forward for the new edition which was written by Astronaut Kathryn Sullivan. Dr. Sullivan has been selected to fly the space shuttle mission which will deploy The Space Telescope and we are especially grateful to her for taking the time to contribute to The High Frontier. I am spending part of my summer at Massachusettes Institute of Technology in Cambridge. This summer MIT is hosting the International Space University (ISU), a project created by Peter Diamandis, Todd Hawley and Bob Richards, all three SSI Senior Associates. The purpose of ISU is to bring together top graduate students from around the world and enable them to work together while also learning about critical space topics and issues. This year’s ISU class consists of one hundred and four graduate students from twenty-one different nations including the Soviet Union, China and Japan. The project is especially important to SSI because it includes a key lunar design project. After spending the morning and early afternoon on lectures the students gather in design teams which are examining the creation of a lunar base to support construction of solar power satellites from non-terrestrial materials. Over the course of the summer these future world leaders are being given an opportunity to learn about the High Frontier from such members of the Institute as Dr. O’Neill, Gordon Woodcock, Peter Glaser, Bill Brown, Buzz Aldrin, Charlie Walker, Andrew Cutler and other leading experts in the use of space resources such as Tom Rogers of External Tanks Corporation, Kerry Nock and Rob Staehle of JPL and Richard Bouldreault of Canadian Astronautics Ltd. In addition the Institute has established a lab area at MIT where we are engaged in two interesting experiments with the students of ISU. The first of these experiments is using the students as test subjects to learn how humans respond to the 2.7 second round trip signal time between the Earth and the Moon. Using several low cost robots produced by the Tandy Corporation (Radio Shack Mobil Armatrons) and a custom control and delay package designed by Rob Lewis and Clark Cohen of G.E. Astro Space Division, the students are controlling machines with a simulated lunar time delay. The project is attracting a great deal of interest and students, teachers and staff from MIT are walking in to learn about the experiment and SSI. In addition, we are conducting a lunar mining contest similar to the famous MIT design contest which is televised each year. As most of you probably know, the contest consists of giving students a bag of parts (identical for each student) and a design task. The students are free to use the parts in any way they choose to build a device to complete the task. The task that we have set for ten student teams and two faculty and staff teams is the construction of a lunar mining device that can operate with minimal human intervention. Response to this contest has been excellent and Richard Gerstch, a mining consultant who has presented his work for our Princeton Conference on Space Manufacturing as well as in NASA studies of mining non­terrestrial resources has agreed to judge this contest. Mr. Gertsch is presently operating three gold mines including the famous Yellow Aster mine in Southern California. The International Space University has attracted an amazing cadre of top notch students. For example the chief designer of the Long March-3 launch vehicle is one of the Chinese students. SSI supporter Randy Briggs of the University of Worcester is one of the students in the Resources and Manufacturing division of the University (for which I am course director). Randy who is a PhD. candidate, is at the forefront of lunar materials processing. His particular expertise lies in the reduction of ilminite to produce oxygen and he has presented papers for the Lunar Bases Conference and will present at the upcoming Space 88 meeting in Albuquerque. ISU is set up to provide close interaction between the faculty and the students particularly in their daily work on the lunar design project. As a result of this interaction, students from all over the world are becoming acquainted with the Institute and its goals. We congratulate the ISU’s founders on this most successful first session of the International Space University. In addition I wish to specially thank SSI support team leader Bruce McKenzie and Mike Massamino for their help in organizing and operating the Institute’s experiments at MIT. Finally Rob Lewis, the chairman of SSI’s teleoperations working group deserves particular acclaim for putting in several twenty hour days to complete the robotics delay systems in time for ISU. He, Clark Cohen and the entire teleoperations group donated hundreds of hours and we are extremely grateful for their help and dedication. What of the arts, and of letters, in a new period of expansion of the human spirit? Creativity is the most difficult of human attributes to predict, but it is at least hopeful that the age of Columbus and of Drake was also that of Michelangelo and of Shakespeare. Dr. O’Neill’s impression that a connection exists between exploration and burgeonings in the arts is essentially correct. Let me illustrate this relationship through theatre history. Every great age of drama has occurred during an age of exploration and discovery. Three elements define a great age of drama: innovation in theatrical production, changes in style of dramatic writing, and ­ most importantly – the creation of dramatic works which stand the test of time as classics, and which are established as the greatest plays to be produced by a particular culture. Three elements define an age of discovery: an awareness and appreciation of cultures outside of one’s own, an active interest in the formation and composition of the world or, in the more inquisitive cultures, of the cosmos; physical exploration of unknown parts of the world. These elements were very much a part of the civilization which gave birth to the theatre: the Hellenic Greeks. Around the ninth century B.C. Greece was in a dark age. The more intrepid Greeks sailed from the mainland to the Aegean islands and coastland off Asia Minor, and there, in the place they called Ionia, they founded small republican settlements. Ionia was dry and rocky, and only good for raising sheep and growing olives and grapes. The hinterland of Asia Minor was difficult to get to, and was populated by hostile kingdoms. The Greeks, therefore, took to the sea for survival. Their travels brought them into contact with two strong empires, the Egyptians and the Babylonians. Neither of these two civiliz.ations had much of a tradition for exploration and in the many centuries of their history there had been little scientific innovation. Both exhibited prowess in engineering and mathematics, however, at the time of the Greek contact these techniques had been generations old and with little or no recent development. Furthermore, the sciences of the two great empires were taught only to the upper ranks of the clergy and the aristocracy, and were only used for the purposes of monument building, irrigation and astrology. The Greeks took more of an interest in their contacts with the Egyptians and the Babylonians than simple trade opportunities. They learned the sciences of these two cultures, and they expanded. The uneven nature of [the Ionian’s] physical environment, with marginal agricultural productivity, little room for landward expansion, hostile neighbors, and the need to trade, made the colonial Greeks dynamic in outlook. By the end of the sixth century B.C., the Greeks were using Babylonian mathematics and Egyptian geometry for navigation and mapmaking. What is more important is that the man who is credited with developing Greek astronomical navigation was Thales, the father of Greek philosophy. Where the older cultures had been content to refer to custom, edict, revelation and priestly authority, Thales and the others looked to naturalistic explanations for the origin of the world and everything in it. They began to find ways of exploring nature, in order to explain and control it, the better to ensure their survival. The combination of the abstract concepts of mathematics and geometry with the natural inquisitive nature of the Greeks, fired by the dynamism of their society led to the creation of western science, western philosophy – and the theatre. For it was out of this period of discovery that drama was born. It was during fifth and sixth centuries that the first great age of drama occurred. It was during this time that epic legends were combined with the poetic structure of choral dithyrambs into tragedy and comedy, and the works of Aeschylus, Sophocles, Euripides and Aristophanes. By the end of the fourth century B.C. the age of Greek discovery was coming to a close. Exploration gave way to militaristic expansion, Greece was being divided by provincial rivalries, and the culture was becoming increasingly introverted. It was at this time that the classic era of playwriting ended. Theatrical production continued in earnest for centuries, but no new noteworthy plays were being written. In the East, the first important age of drama was that of classic Sanskrit playwriting, which, according to the ancient Indian historians, occurred during the Gupta Empire. This period was also the time of great development for the Hindu religion, particularly in the area of Hindu cosmology. Prior to the Gupta Empire, the Indians experienced a centuries old dark age in which the sub-continent was divided into minor kingdoms. The Guptan era brought about a loose confederation of these small sovereignties, and communication and trade were re-established in India. A growing interest in civilizations outside of India (Mesopotamia and Tibet, in particular) emerged among the Guptans. Mathematics and philosophy flowered during the Gupta reign. In the two hundred years of Guptan rule, India became the center of engineering, technology, mathematics and scientific thought within the European and Asian world. This was also the golden age of classic Sanskrit drama. When the empire fell into decay, there was a great decrease in both new plays being written and theatrical production in general. If this pattern of dramatic burgeoning during periods of exploration is consistent, then why don’t we have a body of classic Arabic drama? During the first two decades of the Islamic movement, the southern Arabs explored most of islands and coastlands of the Indian Ocean. They excelled in mathematics, geometry, architecture and physics, and developed a strong interest in the history and cultures of other civilizations. Much of the knowledge of ancient Greek science and art that was “re-discovered” by the Spanish and Italians at the beginning of the Renaissance was given to the Europeans by the Arabs. There was, however, no Arab drama. The reason for this is simple. The Prophet Muhammed feared that idle worship might arise among the believers of Islam. He, therefore, placed a ban on all representational art and encouraged abstract, geometrical design. The caliphs who succeeded Muhammed decided that the one exception to the ban on representational art would be images of the Prophet himself. Ironically, in an attempt to discourage idol-making, Muhammed turned his own image into a popular icon. As theatre is a representational art form, acting and the writing of drama were forbidden by Islamic law. A type of illegal theatre did emerge, however. Travelling story-tellers created tales of explorers and pilgrims who journeyed the known world and discovered a deeper knowledge of themselves. The stories were dramatic in structure and written in verse. They resembled both the epics and dithyrams which were the basis of ancient Greek drama. It is safe to assume that had representational art not been banned by Islamic law, then an Arabic Aeschylus and Aristophanes would have appeared, and we would have a body of great Arabic drama from the Arab age of discovery. The classic era Chinese drama occurred during the Yuan Dynasty from 1260 to 1368. This was the period of the great Chinese ocean going fleets of huge ships, crewed by hundreds of sailors, which explored the Indian Ocean as far as Madagascar, and possibly as far as South Africa. The following Ming Dynasty placed a ban on such explorations and even made it a capital crime to build multiple masted ships. The desire to explore was replaced by an imposed introversion, and the great era of Chinese playwriting ended. During the Yuan dynasty, theatrical production was held in abeyance by the rulers. Very few people saw the original performances of the classic plays of China. By contrast, the Ming rulers were strong supporters of the arts. Many lavish productions were financed by the state. These productions, however, were mostly revivals of Yuan plans. In the introverted Ming era, playwrights were simply uninspired. Despite the monetary support for the theatre, there were no new plays of note written during the unexploring Ming Dynasty. One of the reasons that we see a connections between these two phenomena is that during an age of discovery a period of self­discovery emerges. By looking at other cultures and lands which we did not know existed, by examining concepts of how the universe was created and how the universe continues to work, we come into a confrontation with who and what we are. Because during these periods we change our perceptions of the universe and, therefore, of ourselves. In his book, The Day the Universe Changed, James Burke states that: Discovery is not really the uncovering of something new, but a redefinition of what we know, and therefore a redefinition of what we are. Burke uses the Copernican Revolution as an example of this redefinition. Before Copernicus, the Sun went around the Earth; after Copernicus, the Earth went around the Sun. This was a tearing away of what we thought we knew, and replacing that “knowledge” with a new perception. And changes in perceptions of where we are changes our perceptions of what we are. And ultimately, this changes everything about us and everything that we do. At this point the question of the financial return of exploration and its perceived influence on creativity and the arts should be addressed. In art and theatre history courses students are taught that the reason why the arts flourished during the renaissance is that there was more money available for artists. Indeed, many people have said to me the reason why there are innovations in drama during age of discovery is that exploration leads to increased trade which leads to increased wealth and, therefore, there is more money available for the arts. This view seems logical, but it is not supported by history. During the Yuan Dynasty the theatre was held in disdain by the ruling powers, there was very little money available for producing plays; yet, this was the era of classic Chinese drama. During the following Ming Dynasty, when Chinese exploration was halted, there were plenty of funds available for the theatre, but no great plays were being written. Most productions were revivals of works written during the Yuan period. Similarly, the ancient Greeks supported theatre for centuries, but it was only during the golden age that great works were written. There have been many times in theatre history when play production was well supported financially, but no great works arose; and there have been many times when great ages of drama arose in spite of a lack of funding. The common denominator in all great ages of drama has certainly not been money, but a prevailing spirit of expansion and inquisitiveness, and a desire for outward and self-discovery. Such a spirit and desire existed in Western Europe during the time known as the Renaissance and it is common knowledge that this was the beginning of the Age of Exploration and was a period of great artistic innovation. The Renaissance marked the great age of French and Spanish drama and the first great age of English drama, but what about the other Western European nations? The Dutch experienced a remarkable age of discovery during the seventeenth century, yet we do not generally think of the Dutch having a body of classic drama. The reason for this is simple: unlike the French, Spanish and English, the Dutch had no theatrical tradition prior to their ages of discovery. They had no experience in producing or writing plays. However, once they became sea-faring, scientific explorers, they started to write plays. The Dutch had a short but vibrant era of theatrical innovation. During the seventeenth century, they reached the apex of their seaward explorations and Holland emerged as the European center of scientific inquiry and free thinking. From 1640 to 1690, Dutch theatre emerged and developed. Prior to this time there were no formal theatres in Holland. There were a few halls for rhetorical elocution and the Dutch indulged in presenting tableaus, but no true theatrical tradition. By the middle of the seventeenth century, some of the grandest theaters in Europe were being built in Holland. Dozens of plays, which are still considered classics, were written. By the end of the seventeenth century, this development ended. The golden age of Dutch theatre ended as the seafaring and scientific center of Europe moved from Holland to England, and it was during this transition that the second great age of British drama began. With the exception of William Shakespeare, the greatest British playwrights emerged during the eighteenth century, the time of Britain’s most dynamic era of exploration. The British, alas, followed the same pattern as the Dutch. Alister Cooke has referred to the early to mid-nineteenth century as the winter solstice of British theatre. This change occurred when the British changed from an exploring and dynamic culture to a more introverted, militaristic, complacent and industrial culture. A vibrant era of drama ended quite suddenly, and would not be rekindled until the next century – our era – the space age. The space age is usually said to have begun in 1957 with the launching of Sputnik, but the space age really began in the nineteen­twenties with the work of Robert Goddard and his German counterparts. That remarkable decade not only saw the birth of liquid rocketry and a conscious effort toward manned spaceflight, it was also the time of great innovation in physics and cosmolgy, a period of strong internationalism, and the beginning of the most profound changes in drama since Aeschylus. One was the development of a new medium: film. The motion picture industry began in the 1880s, but it was during the 1920s, with the development of impressionism, expressionism and epic theatre, several new styles came forth, and age old traditions and conventions were replaced by new techniques. The aformentioned eras of great drama are but a few examples of the simultaneity of great drama and exploration. For the sake of brevity, I have not mentioned the Roman, Portuguese, Japanese, German, Italian or Russian drama, but the parallel phenomena of discovery and dramatic burgeoning occurred for those cultures, as well. Now while we can say, conclusively, the great ages of drama occur during ages of discovery and exploration, we must theorize on what this connection is. I think that there are two reasons for these parallel phenomena: The first is the advent of self-discovery: outward exploration leads to more expansive thinking, and this leads to discovery of self. Ages of exploration are ages of self-discovery. All drama centers on self-discovery. All protagonists find themselves on journeys of self-discovery and a play is not resolved until that journey ends. During ages of exploration and discovery, however, dramatists use their plays to explore society and the conditions of the times. The audience, as well as the protagonist is confronted with itself. During these periods drama becomes a journey of self-discovery for the populace. The other reason is the change in perception and cultural invigoration that comes from discovery. The historian Arnold Toynbee believed that civilizations grow out of a pattern of stimulus and response. A stimulus is usually a moment of crisis, a time of great world. Historically, one of the most successful creative responses is exploration. The creative response builds upon the creative energies within a society and stimulates and propels what Toynbee refers to as the creative minority within the culture. This minority is composed of scientists, artists, philosophers and explorers. Discovery is the prelude to creativity, yet we rarely understand this. In the index to the six hundred odd pages of Arnold Toynbee’s A Study of History, abridged version, the names of Copernicus, Galileo, Descartes and Newton do not occur. This one example among many should be sufficient to indicate the gulf that still separates the Humanities from the Philosophy of Nature (Koestler’s phrase for science). The cosmic quest of these discoverers, the search for an understanding of nature destroyed the medieval vision of an immutable social order in a walled­in universe together with its fixed hierarchy, society, culture, habits and general outlook, as thoroughly as if a new species had arisen on this planet. This mutation of the European mind in the seventeenth century is merely the latest example of the impact of the “Sciences” on the “Humanities” – of the inquiry into the nature of Nature on the inquiry into the nature of Man. It also illustrates the wrongheadedness of erecting academic and social barriers between the two. If we look at history in a more encompassing manner, and see how things interact, then we start seeing how exploration and discovery have wide-ranging ramifications, not just in the sciences, not just in education, not just in new information added to the human body of knowledge, but in their ability to stimulate and invigorate the culture. The work of the great explorers, from the ancient Greeks to Columbus, Magellan, Copernicus, Einstein, Goddard and the Apollo astronauts, was more than just a contribution to our knowledge; it was such stuff as dreams are made of. If the pattern of dramatic development arising during periods of exploration continues, and it has been consistent for every great age of theatre, then the advent of space migration will stimulate what will probably be the greatest age of drama. For the act of permanently establishing life beyond our world cannot help but change our perceptions of ourselves, and our place in the cosmos, in a most profound manner,* and this change will pique the imaginations of future artists. At a banquet commemorating the tenth anniversary of the flight of Apollo XI, Presi­dent Jimmy Carter commented on the wealth of materials brought back from the Moon. He said, however, that “the greatest thing that we brought back from the Moon was wisdom.” We learned something about who we are and how limited and fragile we are on this world. Space migration will give us more than wisdom. It will inspire dreams. By exploring the cosmos we shall discover what dreams may come — tomorrow and tomorrow and tomorrow. *See Frank White’s The Overview Effect. 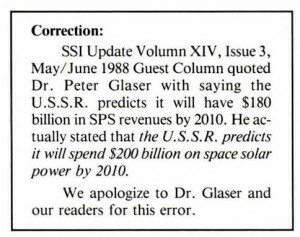 There appears to be agreement on the premise that transportation costs of the materials for construction to a site in orbit (i.e., space station, solar power satellites, etc.) from the lunar surface as opposed to the Earth’s surface are substantially lower. This has led to numerous programs exploring techniques for mining and processing traditional materials for export from the Moon to construction sites. A major obstacle in this approach appears to be the fact that basic aluminum and pig iron are not usable in these forms, but must be further alloyed and processed subsequent alloying seem to call for the transportation of large and complex payloads from Earth to the lunar colony, not only for the initial establishment of the colony but for its later conversion to an exporting entity, as well. As a result of the data gathered on Apollo missions, it appears that all the materials neerled to produce both reinforcing fibers and matrices for composites are readily available in quantity, first from the lunar regolith and from subsequent mining exploration. Further, it appears that these fibers and matrices could be produced and combined into early colony requirements such as habitats and virtually all necessary structural materials for the establishment of the colony. Studies indicate that the original equipment payload to establish this capability could be boosted into Low Earth Orbit easily in a single Shuttle payload. Additionally, replication is relatively simple, allowing rapid expansion to an export mode. 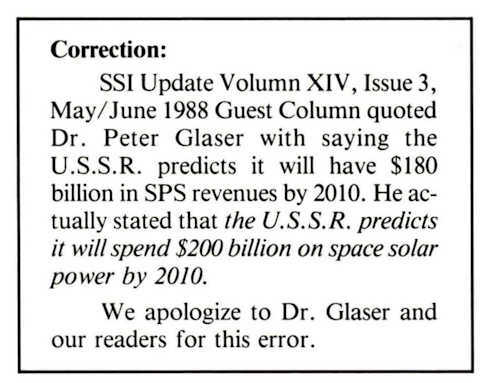 All of this points to a dramatic reduction in both economics and time required for lunar base establishment and development. This paper will outline current activity in substantiating these parameters. Almost all the work to date on materials from the lunar surface has been centered around traditional metallic structural materials. Investigation seems to indicate, however, that composites may represent the better alternative, primarily because the near-term future holds little prospect for making lunar metals competive with Earth metals, either in their basic or alloyed form. Both the original mining and smelting along with subsequent alloying seem to call for the transportation of large and complex payloads from Earth to the lunar installation, not only for the initial establishment of the installation, but for its later conversion to an exporting entity, as well. On the other hand, it appears that for a payload possibly as low as 5000 pounds, virtually all supplies, material, and equipment could be transported to the lunar surface to establish an initial installation from composite materials. While the basic structures would necessarily be very crude and simple they would nevertheless be serviceable and habitable. One important advantage of using lunar composites is that the raw materials for both fiber and matrix manufacture are available at all sites visited during the Apollo missions. A study of samples brought back on various Apollo missions indicates that both basalt and feldspar are plentiful in the lunar regolith. Basalt-produced fiber would be more than adequate to fulfill lunar base structural needs. Feldspar, an important source of alumina, is present in highland surface materials as well as in outcroppings, and can be obtained in a reasonably constant condition and in a state sufficiently free of iron and other objectionable elements. Feldspars, in general, are represented by the formula RXO.Al203.6Si02 in which RXO represents an oxide such as CaO, Na20 or K2O. Lunar plagioclase feldspars are solid solutions of anorthite (CaAl2Si208) and albite (NaA1Si308). 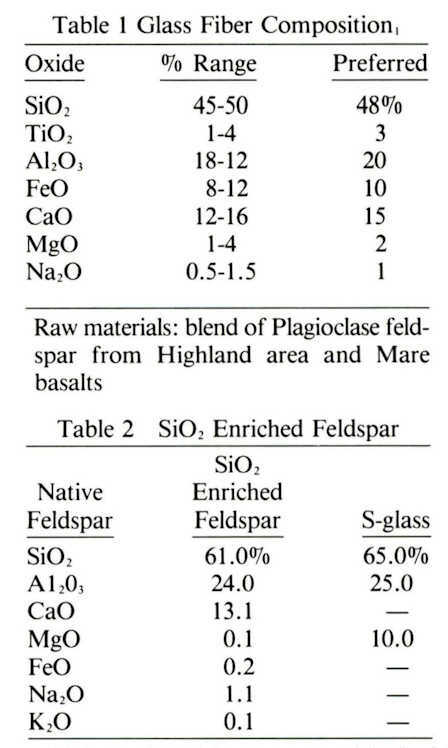 A basalt/plagioclase feldspar blend would produce standard quality fiber (see Table 1). 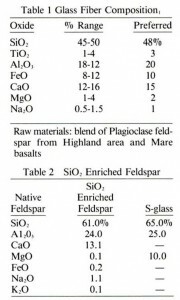 If the native feldspar were enriched with Si02, it would be a close match to S-glass, the highest performance commercial glass fiber produced on Earth (Table 2). And if quartz veins are dispersed as on Earth in the igneous feldspatic highland rocks, then a superior glass fiber can be made from a quartz and feldspar mixture. While our investigations indicate that production of reinforcement fibers from the lunar regolith will be relatively straightforward, it appears the creation of matrix materials will be considerably more challenging. On Earth, the matrix materials used in composites are normally organic in nature, with the exception of the metal matrix composites. There being no organics on the lunar surface, the obvious task is to explore the possibility of an inorganic matrix material. Since we were already concentrating on glass for the reinforcement fibers, we explored the possibilities of making a glass/glass composite, using a low temperature glass for the matrix. Glasses used in the manufacture of reinforcing fibers have a melt point approximately in the 980°C area; the effort here is therefore toward the formulation of frit-like materials having a melting point in the 315° to 375° range. The result would be a composite that would be processed in much the same fashion as the very high melt advanced polymer composites currently being used in the airframe/aerospace industry. It appears possible that the conversion of a glass/glass prepreg to end product may be simpler than in thermoplastic polymer/glass systems. Although both require simple melt-chill processing, the glass matrix should not be subject to the sublimation, oxidation degradation, and chain breakdown problems encountered in polymer heat cycles. Formulae for such frit-like materials are illustrated in Table 3. Another primary advantage of composites is the fact that both mining and refining methods can be relatively crude and simple during the phase of producing materials for the establishment of the habitat and basic structures of the colony. At a later date, these facilities can be upgraded to produce a refined product with the properties required for export. In the manufacture of glass fiber on Earth, “sloughing” of the refractory materials from which the melt tanks are built into the glass causes the most problems. An intriguing possibility for eliminating these problems both on the lunar surface and in space is containerless production, which has the potential of achieving superpure glass by eliminating the refractory container. The exact processing techniques will evolve as studies of manufacturing technology for the frit matrix point up the simplest producible form. The glass/glass composite could be processed by either taking the basic fiber through a molten frit bath prior to forming into finished compenent, or the frit in powdered form could be deposited on the fiber in the proper volume fraction and sintered into a prepreg prior to introduction into the conversion process. Conversion of the basic composite raw material into usable end products will probably entail a large number of diverse approaches, depending on end product requirements, and calling for a case by case review. Initial habitat construction and other simple structures could be produced by simple bending, forming, and welding techniques. Future processing methods would probably follow the generic machine processing currently practiced on Earth. These techniques would include compression molding, filament winding, pultrusion, tape placement, and other more sophisticated conversion techniques. Initial energy requirements for both material production and processing could be met by solar concentrators and a minor amount of electricity that could be generated by solar cell arrays to power fiber drawing and winding drums. Later additional electrical capacity could be added for improved temperature control of platinum fiber bushings. It would obviously be very efficient if the material production process could be tied to the vital oxygen production process, and the possibility of integrating these processes is being thoroughly investigated. Both chemical and pyrolytic processes have been proposed for oxygen extraction, and the pyrolytic approach seems to be favored as it requires less support materials from Earth. The above data was generated during Phase One of our study, which was primarily investigatory. Conclusions from these investigations were used to formulate simulants for actual sample development in Phase Two. As anticipated, the fiber production was relatively straightforward and the early experiments in Phase Two are primarily aimed at developing the lowest melt point matrix that can be produced from Apollo mission derived simulants. The target here is to develop a matrix material with a melt point between 850 and 900°F. To date the best formulation achieved has been in the 1000-1100 °F range. This is still too close to the fiber melt point and is probably damaging the fibers, although visual inspection of preliminary samples indicates that they appear to be intact. However, work is still proceeding to lower this melt point into the acceptable range, and it appears that this is achievable. 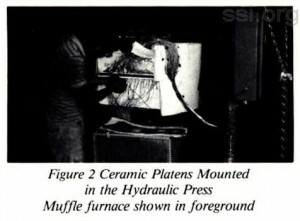 As the intent of the entire investigation is to produce the simplest form of structural material that can be produced with the absolute minimum of equipment that has to be lifted from the Earth’s surface, the initial samples were made from random glass fiber which was slurried into the molten matrix and essentially cast. Additional samples were made using woven continuous fiber reinforcements to provide some idea as to whether the matrix viscosity could be sufficiently low to wet this reinforcement form. The equipment being used for this experimental work is a small muffle furnace for melting matrix formulae candidates and measuring their melt points, and a two-foot square ceramic platen hydraulic press in which sample laminates for testing will ultimately be made. The ceramic platens and heating system in this press is capable of operating at 1100 °F. All of the samples produced to date have been pure casting type samples with no effort to control the volume fraction or porosity of the sample. As soon as we feel we have the proper low melt point formulation, we will start laminating samples with sufficient pressure to control volume fraction and void content. 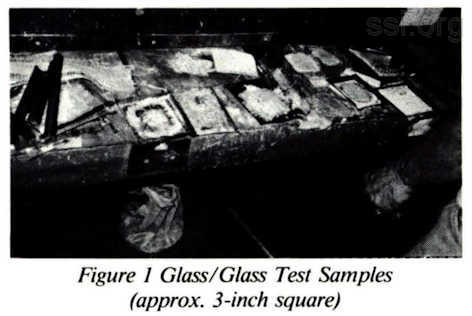 As all initial samples were processed in the small muffle furnace, approximately 3-inch square samples were produced to check melt point and wetting. Figure 1 shows a number of these test samples in both woven fabric rein­forcement form and with random chopped fiber. Most of the samples were produced by using ceramic fiber mat as a parting agent between the cast specimen and the caul sheet. Although there was some penetration into the ceramic fiber mat, it would be wire brushed off to allow examination of the specimen surface. Figure 2 shows the ceramic platens mounted in the hydraulic press, and the number of cartridge heaters in each platen indicates the heating density required to operate the platens in the 1000°F range. The small muffle furnace used in melt point determination and sample casting is in the foreground. Figure 3 shows the operator removing a small 3 x 3 sample from the press. These samples had to be literally sheared from the stainless caul sheets upon which they were made. After early sample testing indicates the direction of on-going development, we intend to move into Phase Three of this program, which will encompass simple forming and fabricating methods that, again, can be practiced without major equipment in order to permit early usage for colonization. Another encouraging factor that has arisen during this investigation is that extensive benefication of the lunar regolith will probably not be necessary. It appears that in most of the mare areas, the overflow of rock-like basalt will permit a direct melt of that basalt into fiber and matrix materials without requiring separation and formulation. Although we have only started with Phase Two work, it would appear that production of a glass/glass composite is feasible, and that this glass/glass composite can be produced with a total initial equipment payload of possibly under 5000 pounds, and can be packaged for transportation in a high density, low volume package. This gives us a great incentive to complete the work outlined, as it would seem to be a means of substantially shortening the time frame for revisiting and initial colonization of the lunar surface. Carroll, W.F., Steurer, W.H., Frisbee, R.H., and Jones, R.M., “Should We Make Products on the Moon?” Astronautics & Aeronautics, pp. 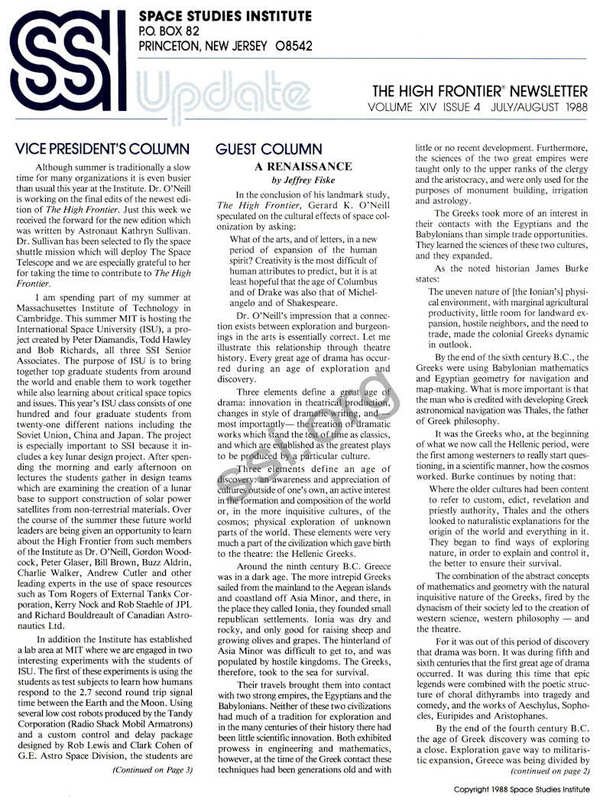 80-85, June 1983 . 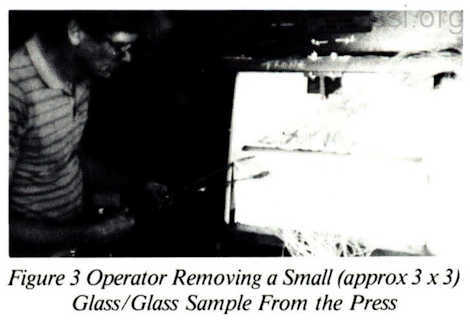 Coggin, C.C., “Composites: Fibers and Matrices from Lunar Regolith,” Phase I Study Program Report, (Glass Strand, Inc., Upland, Calif.), July 1985. Coggin, C.C., “Composites: Fibers and Matrices from Lunar Regolith,” Phase II Development of Glass/Glass Laminates Report (Glass Strand, Inc., Upland, Calif.), March 1988. Goldsworthy, W.B., “Composites: Fibers and Matrices from Lunar Regolith,” presented to Princeton University Conference on Space Manufacturing, Princeton, NJ, May 9, 1985. Goldsworthy, W.B., “Mining for Composites on the Moon,” Aerospace America, pp. 5O-51, October 1985. 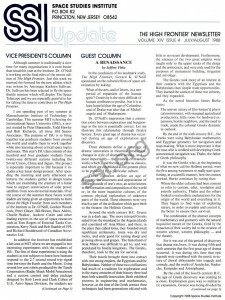 Goldsworthy, W.B., and Coggin, C.C., “Manufacturing Composite Raw Materials and Structures from Lunar Regolith Materials,” presented to Space Tech Conference, Sept. 23, 1985, Anaheim, Calif.
Steurer, W.W., “Production of Oxygen by Vapor Phase Pyrolysis,” NASA Summer Study, Technological Springboard to the 21st Century, LaJolla, Calif., July 1984. Subramanian, R.V., Wang, T.J.Y., and Austin, H.F., “Reinforcement of Polymers by Basalt Fibers,” SAMPE Quarterly, July 1977. In order to accomodate a broad range of presentations, three different types of presentations will be encouraged: 1) the traditional presentation of papers in the auditorium at the Woodrow Wilson School, 2) a poster session and display, 3) an evening roundtable for interaction between participants. A registration fee of $290 includes lunches, coffee breaks and the Friday night banquet. Pre-registration through the Space Studies Institute is available.